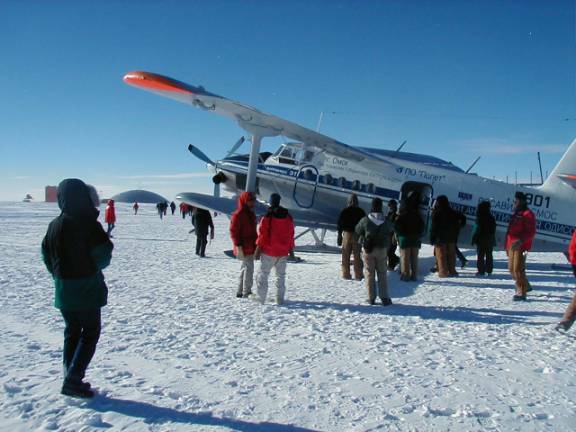 This is a personal viewpoint of the latest Russian expedition, the Antonov-3 biplane aircraft and its occupants that reached the South Pole Station in Antarctica. After reading more than half a dozen different accounts of this expedition from as many different news sources--Reuters, ABC News, the Moscow Times, Los Angeles Times, 70 South, The Antarctican, the Antarctic Sun. These are my opinions and the opinions of a few others. This story should not be confused with the stated opinions of the National Science Foundation, U.S. Government and/or Raytheon Polar Services Company, not to mention the differing stories from different Russian delegations. All photos are from my collections except one; credit is given on that photo. 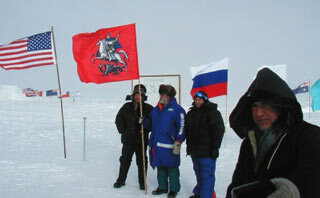 While at the South Pole, I first remember hearing about a Russian expedition sometime in early December 2001. 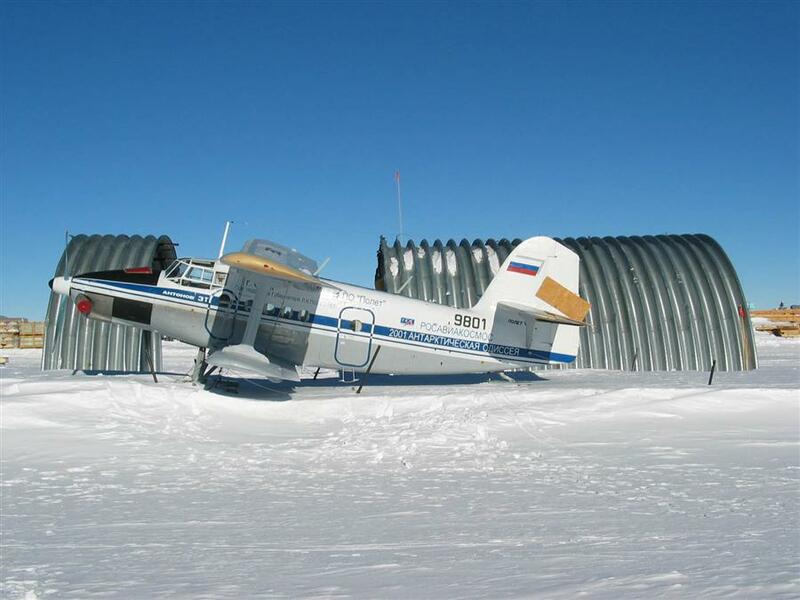 We had reports that a Russian political giant (Chilingarov), was going to fly his personal biplane to the South Pole, under the guise of coming to look at the construction currently being built for the New South Pole Station, with the hopes of rebuilding the failing Russian Antarctic station at Vostok. This was a ploy to make the expedition look like an official government sponsored trip. Hence he would be able to get his aircraft refueled at the South Pole, presumably to be able to get back to his starting point at Patriot Hills. 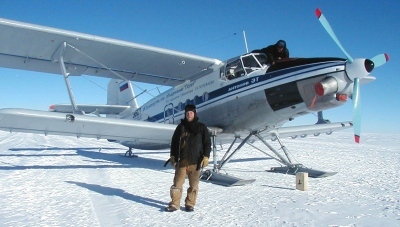 Although the initial information was sparse, it sounded as if he, Artur N. Chilingarov, was going to be the only person in this Antonov-3 aircraft doing a solo hero flight to the South Pole via Patriot Hills, Antarctica. On December 11th I received an e-mail from a friend in France informing me that his Polar Circle Expedition organization was going to be flying down from Ushuaia Argentina to Patriot Hills Antarctica via a Russian IL-76 Aircraft, then onto the South Pole. This was to be the French CERPOLEX (Polar Circle) expedition way of getting here to the South Pole. Due to bad weather delays in Chile and at Patriot Hills, most of the French team was not able to make the eventual trip to the South Pole (their philatelic covers for the expedition did arrive to me via another French tourist, these covers were processed by me and sent back to France via the US postal system). These philatelic covers from my friend in France made quite the trip. France-Chile-Patriot Hills Antarctica-South Pole Antarctica-McMurdo Station Antarctica-Hawaii-California- and eventually back to France. Flying on almost as many aircraft as the number of stops--747s, IL-76, Antonov-3, LC-130 Hercules, C141 Starlifter, and a few others. Great flight covers these would be. This was the first hint that the flight was then going to contain more than just Artur N. Chilingarov. As time went on it sounded like the expedition was going to be cancelled due to bad weather at Patriot Hills. I wondered how he was going to be able to fly the complete distance from Patriot Hills to the South Pole and then back to Patriot Hills. We assumed of course that he would use a fuel cache provided by ANI. That seemed rather strange but what other way was there? Next we started hearing that ANI was not part of this adventure at all and was not going to lend them any assistance except for a once a day weather forecast. In the end this all made sense because these Russians were actually taking away tourist business from them. That being their business, it is understandable why they were not being overly helpful. 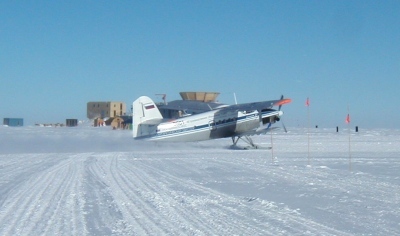 Landing the Russian IL-76 aircraft on the blue ice runway at Patriot Hills was a concern for ANI. But there was nothing they could do about it. The blue ice belongs to Antarctica, not to any one nation. 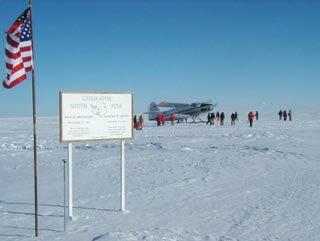 Pretty much the same thing goes for the runway at the South Pole, although much work is put into maintaining the runway by Raytheon Polar Services here at the South Pole. Another week or more went by and the Russian expedition was on and off again. Then word arrived that we would refuel the Antonov-3 aircraft and extend welcome to the official Russian party. Artur N. Chilingarov had swung a deal with the US government for fuel for his airplane. Now the truth started coming out and we heard that the expedition actually contained 7 people; the Russian delegation, and a couple of tourists. 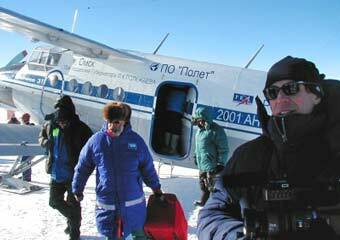 As soon as the word that the Russians had received fuel rights from the US Antarctic Program while carrying tourists on board hit the streets, ANI was quite miffed to be sure. 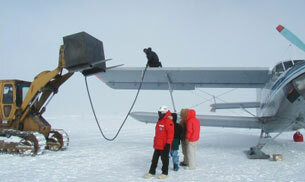 ANI has for years wanted to receive fuel from the South Pole, but have been denied access as per NSF Policy towards private expeditions. Protests and complaints were launched by ANI with the National Science Foundation. Now, not only had the Russians stolen the tourists from ANI, but they were going to get free fuel to boot. This must have seemed like an extreme slap in the face. No matter...the Russians continued. January 7th the Russians landed at Patriot Hills in the IL-76 aircraft. On board were the tourists and the Antonov-3 biplane. It was of course in several pieces waiting to be put together. Within 24 hours the Russians had the plane put together and in flying order. January 8th we heard from ANI. The Russians had launched and were on their way to the South Pole. Anticipation was high at Pole. This was our first ever Antonov-3 here at Pole--big picture taking opportunities for everybody. Something new is coming to town. 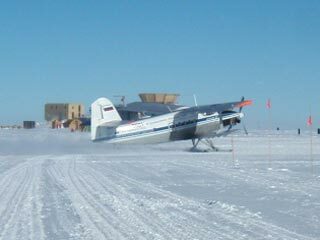 Standing at the cross roads next to the runway at the South Pole, word came across the radio that the Antonov-3 was only a few minutes out. Armed my with camera I eagerly awaited the aircraft. This is a picture opportunity I did not want to miss. Many folks back home will be really delighted to see these digitals. The philatelic world is most eager to see what happens throughout the year. So many folks that will never get the chance to come here view the South Pole through our eyes, envelopes, postcards and pictures. I send weekly updates to my friend in New Zealand, Steven McLachlan. He prints up all the information and pictures on his web site--a total must for collectors of Antarctic philately and information. As I watched the Antonov-3 come into view, I noticed it was much larger than I had imagined. The plane did not land right away. It came right down the middle of the runway, wobbling as it came. Maybe that was the way the pilot was trained to fly or the way the aircraft handles. If either is the truth, I am glad I wasn't a passenger. I think I would have been seasick. Right at the South Pole marker the pilot did a high banking turn and circled back around. This plane ride would have rivaled any roller coaster ride at any county fair. I'm sure it was way more than what the tourists had bargained for. After landing they taxied down the runway to the spot all tourist planes are parked. As the Antonov-3 rolled past me the engine was cycling up and down, not as if the pilot was gunning the engine, but as if the engine was running erratically. Heading back to the Geographical Pole, I did go to get pictures of the airplane with the national flags in the foreground. After fully shutting down the engines, the side door opened up and the Russian delegation and tourists poured out of the aircraft. Now no less than 14 folks came out of the plane. A way different number than what was originally stated. 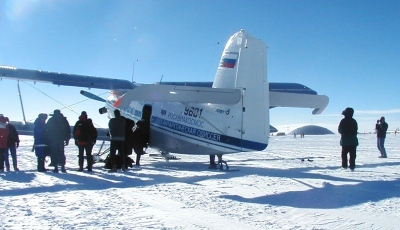 The pilot, copilot, captain, Artur Chilingarov, his group, and 7 tourists from several other countries, were met by the South Pole Station Manager (Katy Jensen), and the National Science Foundation's station leader Jerry Marty, as well as about 30-35 other people. A warm welcome indeed for our tourist friends. Many, many people were taking photographs of group. Lots of hand shaking and small talk. Lots of milling about as the station folks talked with the tourists and admired the Antonov-3 aircraft. Eventually Katy Jensen and Jerry Marty started the group down into the dome. This is a standard greeting for all incoming people--a nice guided tour of the dome and facilities. A trip to the facilities is a must after a long ride on these less-than-desirable aircraft. The group on board were from countries around the world, Russia, United States, The Ukraine, France, Sweden and Switzerland. The prominent individual was a Russian named Arthur N. Chilingarov. Mr. Chilingarov is the deputy chairman of the State Duma and a noted Arctic/Antarctic explorer for Russia. He has spent much of his life in both the north and south polar regions. Most notably he was awarded the Hero of the Soviet Union for his leadership in the rescue of the large Russian ship, Mikhael Somov, which was stuck in the Southern Ross Sea ice for months. His last venture to the South Pole itself was over 10 years ago. Mr. Chilingarov, seen above dragging a large red bag, was not the pilot of the aircraft as was first stated when this expedition was first brought to light. Initially it was said to have been he who was to be flying his private Antonov-3 plane. That is all up for discussion now. The Antonov-3 aircraft seen above looks like a fairly welcoming aircraft. Looks are deceiving. This aircraft has a wonderful new paint job, it looks fairly modern. When viewed up close things change greatly. Looking in the cockpit, things are well worn and gauges are missing. Although it has front-facing seats in the passenger cabin, they are about as comfortable as the strap seating that is in the US cargo airplanes, LC-130s and C141s. Heating? Forget it. The passenger cabin was heated by a small kerosene space heater. Pressurized cabin space? No way. Not ever going to happen. The cargo area behind the passenger area bulkhead was full of small holes. The cloth on the wings had been patched many, many times. The cloth makes for a pretty light aircraft, but not overly strong in my book. It was stated that if the single engine did ever quit, the Antonov-3 had good gliding capabilities. Reassuring...I am sure. I truly wonder how many of the tourists really knew how badly off the aircraft was and still is. The price they paid could not have been worth the trip. Now all 14 of the tourists and many South Pole folks ventured into the South Pole dome. All were herded up to our library, and there were more cordial greetings--this time out of the elements. Coffee, tee, water and cookies were served to all. The next stage, all done through the Deputy Chairman's interpreter, the thank you's and well wishes. 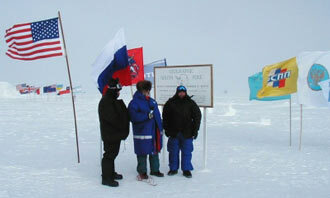 The Russians presented plaques, pictures, and bottles of vodka and caviar, heralding a new and better future to a joint Russian/ American Antarctic Program. Another new end to the Cold War. A very nice surprise it was to receive these items. They were given in return certificates showing that they had been to the South Pole, packets and patches about the South Pole Station, which give a modern overview of what is happening at South Pole. Everything from the information technology available to what the new research facility was to look like upon completion. Lots of introductions of everybody involved from both sides. The pilot of the Antonov-3 was brought forth as a hero. He was presented like he was the Godfather of the Antonov-3, a man who knew the most about flying these craft--he who could single handedly fly these beasts. The aircraft was hailed as the greatest thing since milk and cookies. (They didn't think the same thing about the aircraft a mere few hours later.) Many autographs were even exchanged at that time. I was able to get Mr. Chilingarov, his deputy assistant, and the pilot to sign postcards for me. The above picture shows the signature of Arthur N Chilingarov, hero of the Soviet Union. Deputy Chairman of the State Duma. Now after all of the official greetings were done, everybody headed over to the South Pole store to buy hats, T-shirts, postcards and assorted other memorabilia of their trip to the South Pole. This is a part of their life they will never forget. This is probably one of their most expensive weekends ever. After the shopping spree most folks dispersed throughout the Dome area to take photos--much to the dismay of the station manager and NSF station Leader. Not that we are trying to keep secrets from the world about what is going on here but mostly for control of the hordes and for safety reasons. Many areas exist here at Pole that are not safe for the general public (construction areas, high frequency antenna fields, sewer drainages, and tunnel shafts). Meanwhile, Artur Chilingarov and another few folks went downstairs to the communications building to make a phone call back to the Russian president, Vladimir Putin, to tell of their successful flight to the South Pole. They did make connection with somebody in Russia, but apparently the President was busy at the time. Oh to speak Russian. The secrets we could have learned a day earlier. 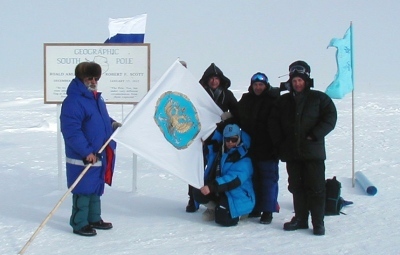 Well, with no President to be had, the group headed upstairs to the flags at the Ceremonial South Pole. By this time many of the group were heading towards the plane. It seemed as if most of them had enjoyed their long and fulfilling day. But it was far from over. Far from over. The flags were rolled back up and the deputy chairman took some of his own personal pictures. Letters were given to me to have cancelled with the South Pole cachets and eventually posted at the South Pole to their final destinations. The letters of course had both useable and non-useable postage applied to the envelopes. Most tourist mail is underpaid. A couple of us pick up the tab on this for them. I think for the most part these folks just don't know the true postal rates. Later the Deputy Chairman lost his gold camera and cannot find it anywhere. The hunt was on for the gold camera. As it turns out, one of his aides had it in his pocket, so the camera was safe and sound again. At this time more gifts are given by the Russians to the South Polies. A case of champagne and fine canned French foods. Seemed like everything that wasn't tied down was given away. All of the goodies were carted off to be shared together by the station at a later date. 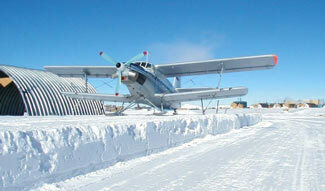 The skis on the aircraft were cut loose from the ice and snow, as they had long since frozen to the ground. The friction of the skis sliding on the ice when they landed heated up the skies enough to melt the snow and ice underneath them when they stopped--a common occurrence with ski airplanes. Final handshakes and goodbyes were said and given and the rest of everybody loaded up into the plane. The door closed and the 4 of us remaining Americans stepped back to allow lots of room for the plane to leave. After what seemed a long time, we finally heard the electric motors/heaters start to turn over. Finally I think, they are leaving, and I will soon be able to go to bed. The plane had been refueled earlier by our folks. Special equipment had to brought to the plane because the wings of the Antonov-3 were so high. The fuel was loaded from the top of the wings, not like what we sometimes see at the airport where the 747s are fueled from the bottom side of the wings. The propeller started turning, turning faster and faster until the engine coughed to life. Then promptly shut down. Still didn't think very much about the situation. Everything here when it is cold takes awhile to fire back to life. So we waited again for what seemed like a lifetime. But really only five or six minutes. A few jokes were made about the worthiness of the craft and then the propeller started turning again. Again the engine coughed to life and shut down. After the fourth try at this I finally gave up and went home to bed. I figured they would get it going soon. I said my silent goodbyes and headed off across to my Jamesway where my bed resides. Surprise, surprise, the next morning when I went to work, the Antonov-3 was still sitting there by the Geographic South Pole. Immediately I wondered if the Antonov-3 was not compatible with our fuel? But I quickly dismissed the idea as ludicrous. All of the US aircraft run on the fuel. And very well at that. (C-5 Galaxies, C-17 Globemasters, C-141 Starlifters, LC-130 Hercules, and Twin Otters) All of our tractors run on the fuel, our furnaces, not to mention the aircraft of the Germans and Chileans. So our fuel is pure as it can be. The Russians' problem was something else. I found out at our morning meeting that all of the Russians and tourists were all bedded down on the gymnasium floor. Katy, the station manager, and a couple of other folks had to find bedding material and sleeping bags for all of these folks. Even the Deputy Chairman slept on the floor in the gym. That morning, he wasn't as happy as the night before. Now the scary thing is that these folks on the airplane did not have any, not a stitch of cold weather gear or survival gear. No sleeping bags, no tents, no extra clothes, no extra food, and no fuel for heating. They did have one very small bag of medical stuff, one vial of morphine, and a couple of bandages. To me this was starting to appear to have been a one way flight, purposely planned by the Russians this way. I'm sure the tourists could not have known about how bad off they was. I can't imagine they would have got on that airplane and paid the money they did if they would have known. Now as the day progressed further attempts were made to start the aircraft. Several times the aircraft was started but never stayed running (kind of like somebody kept turning the key off). At the same time the Deputy Chairman of the State Duma was making phone calls to Russia. He was talking with his connections in Russia about getting the US to fly them out to Christchurch, New Zealand. Further negotiations were on going with ANI about bringing fuel down, helping to fix the airplane. Helping to get the tourists out, maybe getting the Russians themselves out. So far during their trip to Pole the weather had been fine and was fine the next day as seen in the photos so far. This refutes one of the claims by the Russians that the weather wasn't good enough to let them fly out. Another one of their claims was that they did not feel the craft was worthy at that altitude and climate. Well why did they fly then in the first place to the Pole in this contraption? Why did they subject the passengers to this? Well the radio negotiations continued that day. Again they spent the night on the floor in the gym, although well fed and warm. The next morning word came down the line that the Russians were getting pulled out by the next LC-130 Hercules that was coming to the South Pole. The tourists are to find their own way back. ANI agreed to fly the tourists back at the price of a full fare. Here comes the revenge of bypassing the only real tourist organization in Antarctica. Money in the bank first then flights home. Although very expensive, it is understandable. ANI had to kick off 7 already-paying customers on the south bound DC3. This to accommodate the 7 tourists at Pole. So now here is another money output by the traveling folks. The plane ride by ANI costs roughly $25,000.00 US per round trip per person. Now add the price of their Russian connection from Chile to Patriot Hills to South Pole. I can only think this part cost them $30-35,000.00 dollars each. Wow, what a plane fare. I think I would have been very perturbed by this outcome. Now came the offloading of what everybody had left on Antonov-3 plane. The tourists pretty much only had what was on their backs. The Russians and film crew picked up all of their gear and bags. Lots of pictures were taken of people in front of the Antonov-3--pictures as if they were saying their last goodbyes. Never to see the aircraft again. We at the South Pole were instructed by the US State Department to drag the aircraft away and put it in safe storage for the winter. This so that the Russians could come back next year and retrieve it. This is what was still being said at the time. That was to change within two days. (We figured this to be another moneymaking ploy so that the Russians could bring more tourists down the following year, when they came back to retrieve the aircraft.) Next came the 953 Caterpillar tractor to tow the Antonov-3 away. It looked like the airplane had received a ticket and was being towed away from a no-parking Zone. Towlines were hooked up and set around the skis then attached to the tractor. With ever-such a slight jerk the plane was pulled free from the ice and started on its next leg of its journey to the icy snow berm that would become its winter berth. The Antonov-3 pulled very easily. Of course when the wings of the craft are covered in cloth there is not a whole lot of weight involved. 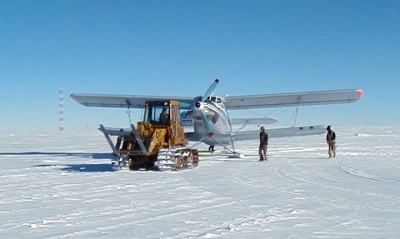 As the tractor pulled the plane down the runway I followed behind on a snowmobile. I picked up the Russian mechanic of the airplane. He helped push the tail of the craft around the corners. He seamed to be genuinely interested in making sure the plane got to its resting place in one piece. Now as we traveled behind the plane he kept telling me something. My Russian being nil and his English virtually nil we kind said what? Hah? What? Not to mention the wind blowing in our ears. But what he kept telling me was the word "PRESENT", Present for you. He kept pointing at the airplane. Strange I thought, but maybe he was just making a joke about the bad aircraft. We finally arrived at our destination. The mechanic jumped off and went to make sure there was nothing left that they wanted. He then attempted to tell us how we should tie down the aircraft. We already had the idea. He was very pleased with the results. Again he told me "Present for you". Then gave me one of the leftover jackets that were left in the plane. Again saying "Present". So I just smiled and said "thank you." I took him back to meet his group as the LC-130 was coming in. It was visible in the distant skies. I shook his hand and said goodbye. That was the last I was to physically see of the Russians and the tourists. Several of us secured the aircraft and locked it up. We inventoried what was left and boxed the contents up, in case the boys ever came back. Doubtful but still the right political thing to do. By the end of the day the Russians and tourists were all gone. It seemed as if we were back to our normal way of life again. 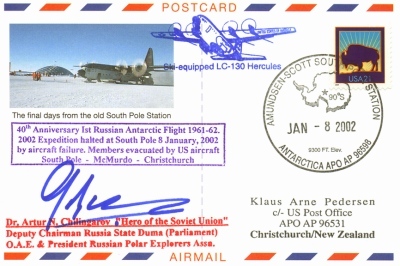 The Russians were on their way to Christchurch New Zealand via McMurdo Station; the tourists were headed back to Patriot Hills to ride the IL-76 aircraft back to Chile. Many memories for many years to come. I heard the next day the Russians had made it to Christchurch. They were met by the Russian ambassador to New Zealand. Rooms were booked for them at the Millennium Hotel in downtown Christchurch. A very nice hotel indeed. From gymnasium floor to plush living in one of Christchurch's finest hotels. Not bad. Not bad at all. 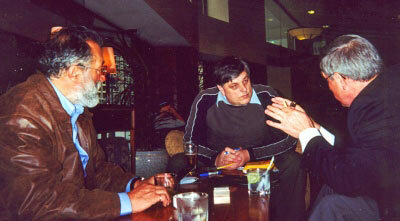 Two friends of mine in Christchurch arranged an interview with the leader of the group of Russians, Artur Chilingarov. Questions were asked and answers given. Autographs were handed out. A very nice meeting indeed. Translations were provided by the Russian ambassador to New Zealand. The most interesting answer that was given was that, the airplane now belonged to the South Pole. They had no intentions of ever coming back to get the aircraft. They were donating it to us as a piece of history. Another version that was later to come out once the Russians were back in Moscow was that Artur Chilingarov said that he was planning on coming back in a couple of months to get the airplane. But this time he was going to bring along a couple of Monks and they were going to build a small church at the South Pole and sing songs. About the same time as all this was happening in Christchurch, The National Science Foundation presented the Russian Antarctic group with a bill for services rendered. The bill included their hotel stay at South Pole, the price of the fuel we pumped into their aircraft and the plane tickets back to New Zealand. The total bill was $80,000 US. The Russians were now to complain about the bill. They said that they had not been told that they were to be billed for the services rendered to them They thought it was all going to be free. How can they be so naive? The Russians spent very little time in New Zealand and were soon back in Moscow. Has the $80,000 bill been paid or resolved? Was this truly a Russian government-backed adventure...or just a private group? A way of making money by charging vast sums of money to tourists for a trip to the South Pole? What do the tourists now think about their South Pole adventure? This would be very interesting to hear. The French guys are making a movie about this trip. Will we get to see it eventually? What will the future repercussions be? How trusting can the US Antarctic program be in the future toward lending money and services to other groups? Who really made out on this deal? I know it was good for me in a historical point of view. Philatelically and photographically it was a success. How much did the Russians make on this deal? Maybe just enough to pay for their own South Pole adventure? I bet after losing initially, ANI made a few dollars out of it. Are the Russians ever coming back for the airplane? Or is it now more garbage for the US government to haul out of the South Pole? These questions and many more may or may not ever get answered. 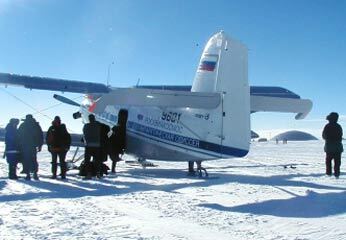 Only next year here at the South Pole will tell what happens to the Antonov-3 aircraft. Does anybody out there want to purchase a slightly used Russian aircraft? Again, the above text and photos are by Scott Smith. The photographs were posted by Scott Smith elsewhere, but the ones I've used here are from Steven McLachlan's site. As a postscript, Artur Chilingarov (who was only in Christchurch for 24 hours before returning to Russia) met with Steven McLachlan (along with Gennady I. Shabannikov, the Russian ambassador to New Zealand, who acted as interpreter). As for the aircraft...it would remain at Pole for THREE years, until a Russian team would show up in late December 2004 to repair it and fly it out. 2004-05 recovery effort starts here.